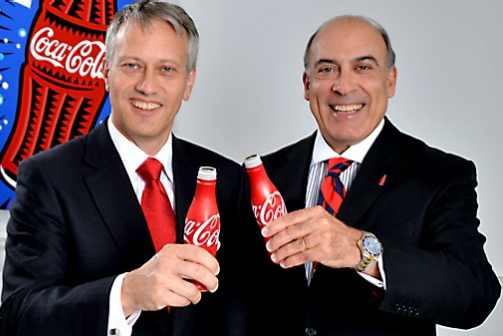 Coca-Cola's chief executive, Muhtar Kent, is stepping down next year and will be replaced by the soft drink giant's operating chief James Quincey. Under a new leadership structure, company veteran James Quincey, Coke's president and chief operating officer, will succeed Kent as chief executive on 1 May 2017. Kent will continue as chairman of the board of directors. Under Kent, who became chief executive in 2008, Coca-Cola has struggled to stop a decline in annual sales for the past three years as customers consume less soft drinks. Kent started at Coke in 1978. Quincey, 51, was named Coca-Cola's president and chief operating officer in August 2015 and is a company veteran of 20 years. He is credited with putting in place a new international operating structure and leadership team earlier this year to make the company more efficient and effective at the local levels, helping operating units become faster and more agile. Kent said: "Managing The Coca-Cola Company to ensure our long-term growth requires a thoughtful and orderly succession planning process." "I have been engaged with our management development committee and the full board on talent development and succession discussions throughout my tenure as CEO. We are certain that James Quincey is prepared for these new responsibilities and is the absolute right choice to lead our company and system into the future."